Tonight’s run was gruesome. I’m starting interval training and I was excited too because it was my first run with my new toy – a heart rate monitor that syncs perfectly with my Runkeeper. The run consisted of a five minute slow warm-up, followed by ten minutes fast, five minutes slow (walking pace) and then ten minutes fast again. Yamashita Park – a great place to run and an even greater place to sit! The first fast interval nearly killed me. I figured that ten minutes would take me around Yamashita Park about one and a half times. My new heart rate monitor was telling me through my headphones that my heart rate was in the 80-90% zone which I looked up when I got home, and this turns out to be spot on for a fast interval. Needless to say, I couldn’t talk. Then my phone rings. I pick up with a quick squeeze of the control on my headphones and I attempt to say something. I hung up. The phone rings again. The five minutes of walking in between the two fast intervals was glorious. 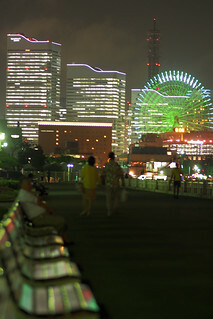 It seemed to last forever and I had a beautiful view of Yokohama to enjoy. The second interval was worse than the first although at least I didn’t get interrupted by phone calls. I still managed to hold my heart rate up in the 80-90% zone for the whole ten minutes which wasn’t easy for me. And at the end of the interval, I felt a bit nauseous for a few minutes and I was worried I might lose my lunch, especially since I’d spent a lot of time and effort making that homemade pesto from my home grown basil! My favourite part of tonight’s run though, as always, was sitting on the bench at the park afterwards with my Procari Sweat. Once I had rested enough to be able to talk again, I called mum back.